New York, New York – The Empire State has long been acknowledged as America’s “Melting Pot.” With the continuous influx of people that brought their ethnicity and culture from all over the globe into its five boroughs, New York has become the face of the world. And that ethnic diversity is in full display this Saturday (July 26) in the sport of boxing in its most famous stage – The Madison Square Garden which is popularly known as “The Mecca of Boxing” to fans of the Fight Game. David Berlin, the executive director of the New York State Athletic Commission articulated it well in Wednesday’s press conference for the big fight this weekend. The main event this Saturday at The Garden will be contested by Gennady Golovkin a champion from Kazakhstan and a challenger and former champion from the other side of the world, in Daniel Geale of Australia. Its co – main event will feature two rated challengers from nearby Philadelphia and a Cuban fighting out of Ireland – Bryant Jennings and Mike Perez. Three other fighters in the undercard came from the United Kingdom, France and Nicaragua. All of them take great pleasure in fighting in New York City. 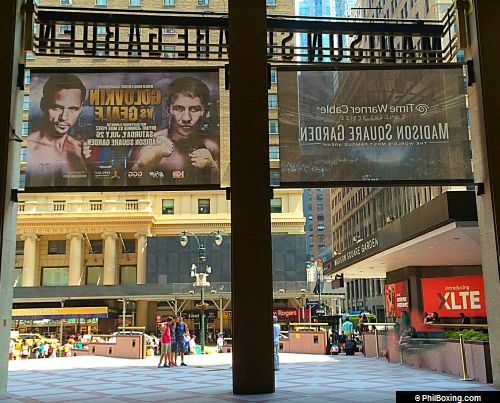 The Golovkin-Geale banner (L), viewed from inside the Madison Square Garden main entrance. And when a place attracts this pool of talents from all over the world, some of them become legends in the ring. “You hear the great names, Muhammad Ali, Joe Frazier, George Foreman, Rocky Marciano, (Sugar Ray) Robinson, (Marvin) Hagler, (Roberto) Duran. The list goes on and on. But you hear those names and you can’t help but think, about boxing’s great history and about how New York and especially The Garden, helped to form that history. “continued Berlin. Their names may not be as big as those that were mentioned above and plenty will never be remembered after they fight, but like the great names behind them, Golovkin, Geale, Jennings, Perez and the rest of the fighters this Saturday will be aiming for the stars in the venue that produced superstars. New York and The Garden was not only a ground that made names - it is the ground where legendary fights and legendary nights happen. Not so long ago, one of its favorite sons, another talent from across the sea, Miguel Cotto of Puerto Rico not only sold it out (again), he also wrote history by becoming Puerto Rico’s most decorated champion by beating a favored Sergio Martinez here. And everything that these prospects and stars do in the ring - it can be a superstar-making night or a dismal showing- all are recorded and broadcasted by the herculean New York press to the world. Nothing escapes their eyes. They praise and criticize you based on your last performance, just like the stars of its Broadway shows. “On Saturday night that tradition will continue. Gennady Golovkin, Daniel Geale, Bryant Jennings, Mike Perez, you are fortunate men to be able to join that tradition. But you were also men who have earned your way here. On Saturday night, New York will continue its tradition as a great fight town.” added Berlin who heads the oldest boxing commission in the world. Golovkin and Geale not only dreamt of fighting here, (Both are fighting their first fight in the “Big Room” while Golovkin has fought in the smaller theatre adjacent to MSG twice in the past. ), they also dream of winning in that Big Stage, in front of those bright lights. Geale wants to walk away with his opponent’s belts in what will become a huge upset this weekend if it happens, while Golovkin is hell bent in keeping those belts and his reputation as one of the sport’s most dangerous fighter. The Mecca of Boxing and The Big City will put them to the test this Saturday. You can reach the author via email at rrmaze24@aol.com and is on Twitter @Freemazon910.